Steriods make good drinks too! I get a strange range of press releases and this one made me laugh. Tucked at the bottom of the Newark Airport press release was this picture of a needle and a drink…and of course since we’ll eventually find out that all old athletes have used steroids. But for now we’ll make fun of A-Rod and enjoy a drink that’s served with an injection…AWESOME. Available on opening day, April 6th, served throughout the Red Sox season. The A-Roid starts with a shot of El Mejor Tequila, served straight up. 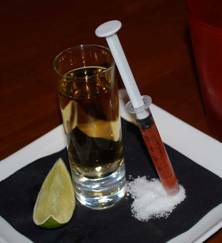 To give the shot a little something extra; a spicy smoky splash is served on the side in a convenient syringe…minus the needle. Inject the Performance-Enhancing Boost of Spicy Tomato “Juice” right into the shot or use it as a chaser. However you use it, come clean and acknowledge it…don’t deny it. With baseball season upon us, Bonfire Steakhouse unveils its seasonal Red Sox menu and the new A-ROID Cocktail, inspired by the superstar Sox fans love to hate. When the Red Sox are up, grab a seat at the bar, and enjoy a menu especially created by Executive Chef Bobby Bean for Red Sox fans! Enjoy The A-Roid with any of Bonfire’s new Red Sox inspired menu items. Bonfire Steakhouse is located at 50 Park Plaza, adjacent to The Boston Park Plaza Hotel & Towers. This South American inspired restaurant has an open-view kitchen where the food is prepared over an open flame. The kitchen is a fusion of an American steak house with a Latin flavor. The bar offers over 50 premium tequilas and a choice of over 200 wines. www.bonfiresteakhouse.com .